Synchronize and operate multiple HPV-X2 cameras simultaneously for calibration and control using Correlated Solutions’ VIC-Snap Remote app for mobile devices and the VIC-3D™ System. Extreme Sensitivity & Recording Speed – Best in its Class. The HPV-X2 features a proprietary high-speed, high-sensitivity FTCMOS2 Advanced Next-Generation Burst Image Sensor, rated at ISO 16,000 and captures 128 or 256 consecutive images at 1,000–10 million fps. 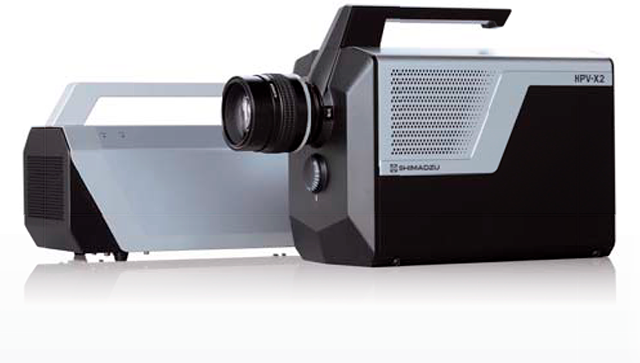 The HPV-X2 connects to a PC laptop via ethernet and supports various recording parameters combining numerous trigger and recording modes, including synchronization of multiple cameras for digital image correlation (DIC) and 3D imaging in master/slave mode. It truly is, the best in its class. Our eyes are incapable of capturing phenomena occurring at times shorter than 50 to 100 microseconds. As a result, high-speed video cameras are necessary in order to record phenomena occurring at intervals that cannot be seen with the human eye. 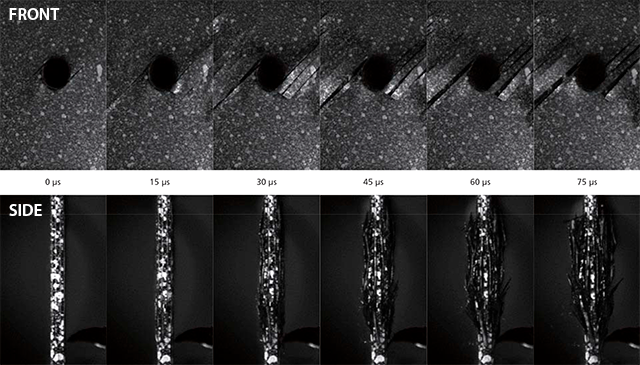 The video can be replayed at a slower rate to visualize the high-speed phenomena. 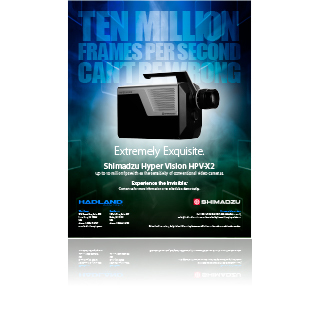 The Shimadzu Hyper Vision HPV-X2 ultra high-speed video camera is the industry standard tool for visualizing ultra high-speed domains in a variety of fields, such as academics, aerospace, automotive, electronics, government, industrial, materials testing, military, medical, scientific. sports, technology, and others. Image storage memory is located outside the image sensor on typical high-speed video cameras. The number of signal output taps are extremely small compared to the number of pixels. Video signal transfer from pixels to memory is a sequential, serial process and ultra high-speed recording of more than 1 million frames per second can’t be achieved. Shimadzu’s FTCMOS2 Advanced Next-Generation Burst Image Sensor has been engineered to match the number of on-board memory to frames recorded. Video signal transfer from pixels to memory is a seamless, parallel transfer, making it possible for ultra high-speed video recording up to 10 million frames per second and high-resolution video recording up to 5 million frames per second. Memory is positioned next to pixels on conventional, CCD burst image sensors. Problems with signal leakage from pixels to memory usually produce poor quality images. Shimadzu’s FTCMOS burst image sensor utilizes CMOS technology, spatially separating pixels and memory, achieving superior, high quality images without signal leaks. Shimadzu’s FTCMOS2 Advanced Next-Generation Burst Image Sensor’s light sensitivity is rated at ISO 16,000 – six times greater than the FTCMOS sensor, thanks to the adoption of our incredible new CMOS process. The light sensitivity of the HPV-X2 has been improved six-fold compared to our conventional products by adopting the FTCMOS2 Advanced Next-Generation Burst Image Sensor. The resulting improvement in signal-to-noise ratio yields clearer images compared to conventional products using the same optical system. Accurate synchronized recording can be performed using two HPV-X2 ultra high-speed video cameras at frame rates up to 10 million frames per second for invaluable visualization results for analysis. 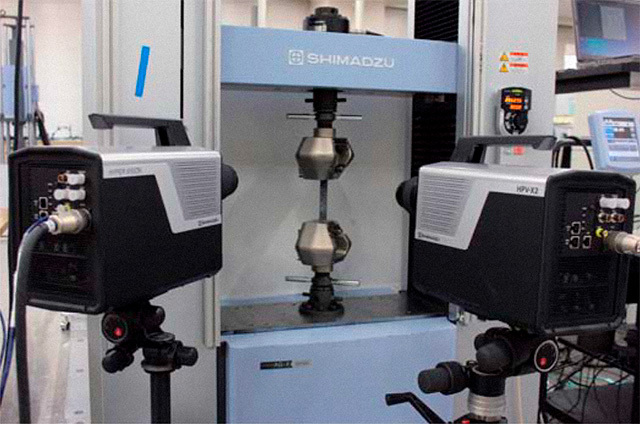 Two HPV-X2 ultra high-speed video cameras positioned for DIC in front of Shimadzu’s AG-Xplus series precision universal testing machine. 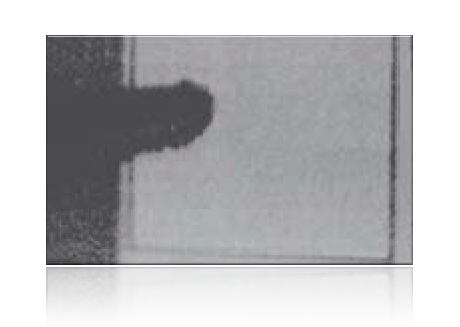 Front and side view image results from the CFRP breakage test. (1) Shimadzu does not guarantee that all F-mount lenses can be attached. (2) The recording speed is a reference value. It is not guaranteed to be an accurate value for the time interval between recording frames. (3) Stored images will be 400 × 250 pixels (horizontal x vertical). (4) 10-bit refers to the data format. It does not indicate a guarantee of data precision. (5) Exposure times are rough indications and are not guaranteed as exact exposure time ratios for all recording speeds. (6) Windows is a registered trademark of Microsoft Corporation. Press the button already or call 1-888-43HADLAND (1-888-434-2352) to get your HPV-X2 (or at least find out more information). Get 2 for 3D DIC (digital image correlation)!